With many different sponsorship opportunities available, Mayfest is able to tailor-fit a package designed just for your company. Sponsorship levels start at just $5,000 and are the fastest way to show our roughly 200,000 patrons just how much you care about their community. If you are interested in sponsoring Mayfest, please contact us for more information. Please be sure to include your contact and company information. Our latest FESTIVAL SUMMARY is available here. It is a wonderful, comprehensive publication with complete summary details and photos from Mayfest 2017 with the sponsor’s perspective in mind. Aren’t friends just the greatest?! We think Mayfest “Friends” sure are and we’d love for you to be our friend! When you donate to Mayfest, you are helping the Fort Worth community and ensuring that Mayfest will continue for many more generations. Just think of how many smiles, laughs, and memories will be made in years to come – all because you decided to donate to Mayfest. All donation levels over $50 include tickets to the festival and, most importantly, the satisfaction of knowing that you did something great for your community. Please CLICK HERE to download the Friends of the Festival Brochure. All donations are tax-deductible to the fullest extent allowable by the law. Mayfest, Inc. is a 501(c)3 non-profit organization. 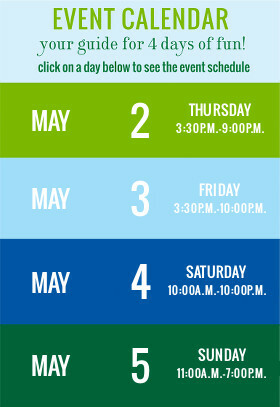 Mayfest is an annual four-day family festival held on 33 picturesque acres in Trinity Park in Fort Worth, Texas. 200,000 people attend Mayfest each year to experience the many different attractions and areas. From young to old, Mayfest includes something for everyone and entertains the entire family. With three dedicated music stages playing over 70 hours of live music, everyone will definitely be entertained - no matter what their taste in music might be! Pop, Rock, Country, Jazz, Texas Country, Bluegrass, Cover bands, and more are heard throughout the festival grounds. If you love music, you'll love Mayfest! The mission of Mayfest is to raise and contribute funds to enhance the Trinity River, surrounding parks and community programs. Mayfest has given more than $7.5 million to the Fort Worth community since 1973. Most people who enjoy Mayfest do so because it’s a fun way to make lasting memories with their family and friends. But Mayfest is more than just a festival! The proceeds generated by this wonderful event are used to provide grants to our three founding organizations further enhancing the quality of life for North Texans. In the history of Mayfest, more than $7,500,000 has been given back to the community! The following grants have been awarded totaling $135,000 from the proceeds from the 2018 Mayfest Festival. Kids in the Kitchen - empower youth to make healthy lifestyle choices and help reverse the growth of childhood obesity and its associated health issues. All Aboard Training Program - prepare women to be effective leaders in the community through critical training, seminars and interactions with community leaders.